The Research Scholars in Residence Program was established several years ago as an initiative of the Kennedy Library and has since developed beyond expectations. Now housed in the Office of Research and Economic Development, the program welcomes to campus distinguished scholars from academia and industry who have retired from their primary careers, but by no means from active and involved intellectual lives. Scholars are provided a base from which to work on campus and encouraged to pursue their own interests, in collaboration with Cal Poly faculty and students. We are fortunate to have them as members of the campus community. Their involvement has led to joint research projects with faculty and students, the receipt of new grants from the federal government, mentoring of faculty in the development of grant proposals, and refereed publications citing their Cal Poly affiliation. If you are interested in tapping into this resource, you are encouraged to contact them, either directly or through our office. In addition, the Research Scholars in Residence Program hosts an evening seminar series, in which Scholars discuss their work in talks suitable for a general audience and open to the local community. Dr. Craver has published on a number of topics in early twentieth century European and American history. Her work on the intellectual migration to the U.S. in the 1920s and 1930s includes “The Emigration of the Austrian Economists,” History of Political Economy (1986) and a 1978 television interview with the 1974 Nobel Memorial prize-winner in economics , Friedrich von Hayek. Her work, “On the Boundary of White: The Cartozian Naturalizaton Case and the Armenians, 1923-1925,” Journal of American Ethnic History (2009), examines a 1923 legal case challenging the admissibility of Armenians to U.S. citizenship. She has also written on the Italian socialist party and labor movement including “The Third Generation: The Young Socialists in Italy, 1907-1915,” Canadian Journal of History (1996). She has previously taught at UC Riverside, University of Kentucky, and other universities including the University of Trento (Italy). From 1971 to 1988, Dr. Dunning served as Assistant Head of the Electrochemistry Department at the General Motors Research Laboratories. In 1988, he established the West Coast Operations office and laboratories of General Motors’ Delco Remy Division. In 1997, he joined General Motors Advanced Technology Vehicle Platform, where he managed multinational programs for the United States Advanced Battery Consortium (USABC) and the Program for a New Generation Vehicle. Dr. Dunning’s primary research area has been electrochemical energy conversion and storage. He developed batteries and fuel cells for transportation applications, as well as specialized electrochemical and chemical processes. He also developed a battery for the Impact prototype vehicle, later the production EV-1. His work has supported motor and motor control development, hybrid vehicles such as the GM-Allison Hybrid Transit Bus, and other advanced battery test equipment. After retiring from General Motors, Dr. Dunning established Epsilon Research Services, a consulting firm that assists business, government, academic and public policy clients in developing advanced technology for the transportation, defense, health and energy sectors. He also served as Executive Director of Electricore from 2001-2004. This non-profit organization collaborates with industry and universities for design, demonstration, and deployment of advanced technologies in private-public partnerships with the Departments of Defense, Energy, Transportation and others. Dr. Dunning’s contributions include patents and publications in the field of electrochemical engineering. He has been active in electric vehicle competitions, where he has set world records for fast charging and quick-change battery technology and electric vehicle racing. He has given numerous presentations worldwide and served on advisory boards for the U.S. Department of Energy and international organizations. His R&D teams have received both the General Motors President’s Council Honors Award and the prestigious Kettering Award. As a senior scientist at Rocketdyne and Schafer Corporation, Dr. Field designed and analyzed advanced high-energy laser optical systems and advanced optical coatings for high-energy laser and surveillance systems. During his retirement, he has developed informal science education programs including walks, talks, and poster exhibits as a docent for the Morro Bay State Park Museum of Natural History. As an adjunct physics professor at Cal Poly, he has supervised more than two dozen student projects in physics and biology and developed and taught an advanced physics course on solar and global evolution. Dr. Field and his students have investigated structure, composition, and energy flow in the interiors and/or atmospheres of the Sun, Earth, Venus, and Jupiter. He has built Mathcad models to solve differential equations of stellar and planetary structure and evolution. He and a student developed Mathcad and/or NetLogo "diffusion-style" models of thermal conduction, radiative transport, and thermal convection in the interior and atmosphere of Jupiter. He currently is developing Mathcad models to investigate cosmological properties of our expanding flat universe from its earliest days to the far future. Using the Friedmann equation, the models explore the 13.8 billion year evolution of composition, density, temperature, cosmic scale factor, recession velocity, and acceleration. Models may include the early inflationary period that is believed to have flattened the universe in a small fraction of a second after the Big Bang. His current goals are to collaborate with students, teachers, and other professionals to develop a cosmic evolution project website that highlights the evolutionary history of the universe, the solar system, the Earth and its geobiosphere, and brains and tools, and to develop simple math models and animations of the structure and evolution of complex natural systems. Dr. Genet has taught courses in electronics, mathematics, communications, astronomy, history, and sociology at a variety of institutions in California, Ohio, Mississippi, and Arizona, as well as individualized aircraft flight training. He currently teaches general astronomy courses at Cuesta College and specialized short courses at Cal Poly, where he recently chaired a conference on small telescope astronomical research. Early in his career, Dr. Genet designed guidance systems for rockets and developed gyroscope and accelerometer tests. He also designed a reentry plasma experiment for the Gemini space capsule. In the area of systems analysis, he developed computer simulation models of rockets and aircraft, including the first computerized life-cycle cost models. He has also applied medical diagnostic mathematical analysis techniques to equipment fault detection and developed aircraft flight training simulators. In the area of astronomy, Dr. Genet has authored and edited several books and papers, organized symposia, and appeared in television documentaries. He founded the Fairborn Observatory on Mt. Hopkins, Arizona, where he developed automatic telescopes and helped establish the first fully robotic observatory. Dr. Genet has been working with faculty and students in Mechanical Engineering and Physics at Cal Poly, developing research telescopes that explore the application of recent technological advancements. Dr. Genet has also organized several local workshops and a conference on Small Telescopes and Astronomical Research. 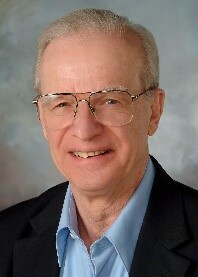 Dr. Hill currently is Professor Emeritus of Mathematics at the Georgia Institute of Technology and Adjunct Professor of Electrical and Computer Engineering at the University of New Mexico. He has also held visiting research positions at universities in the Netherlands, Mexico, Israel, Hawaii, Germany, and Costa Rica, as well as at various American universities, including U.C. Berkeley and Washington University. Dr. Hill’s major area of research is the mathematical theory of probability, with particular emphasis on the three fields of Optimal Stopping, Fair Division, and Benford’s Law. Currently Dr. Hill is working on research in optimal statistical methods for consolidating data from different experiments, Benford’s Law in dynamical systems, "cake-cutting" counterexamples, and questions concerning random processes in physics. The American Mathematical Society recently published Dr. Hill's memoir, Pushing Limits: From West Point to Berkeley & Beyond. Dr. Leijonhufvud is Professor Emeritus at the University of California at Los Angeles, where he was on the faculty for more than 30 years. He started the Center for Computable Economics at UCLA and was its Director from 1991 until 1997. He was awarded an honoris causa doctoral degree by the University of Lund, and was appointed Professor of Monetary Theory and Policy at the University of Trento in Italy, where he is also part of the Computable and Experimental Economics Laboratory. He is one of the pre-eminent Keynesian economists of the second half of the twentieth century and has published a widely used scholarly book, On Keynesian Economics and the Economics of Keynes. He is one of the first scholars to work in the area of computational macroeconomics, a field using computers to study the aggregate effects of bounded rationality of agents in complex systems. Dr. O’Connell is Professor Emeritus at the University of Virginia. He was on the faculty at Virginia for 25 years, following 22 years at the University of Florida. He has been a Visiting Scholar or faculty member in Denmark, The Netherlands, New Zealand, and Portugal. His interests include molecular thermodynamic modeling for phase equilibrium and physical properties, especially for process design; molecular simulation of micellar structure and of fluid properties; adsorption and surface diffusion; properties modeling for hydrophobic chromatography bioprocessing; and thermodynamic analysis and property models for thermochemical decomposition of water to manufacture hydrogen and of chemical absorption of CO2. Dr. O’Connell has published more than 150 journal articles and coauthored 6 books, including the reference book, Properties of Gases and Liquids, 5th Ed., and the textbook, Thermodynamics: Fundamentals for Applications. He is a Fellow of the American Association for the Advancement of Science (AAAS) and the American Institute of Chemical Engineers (AIChE); he was chair of the AIChE Fellows from 2004 to 2013, and has been an editor of Fluid Phase Equilibria. Dr. O’Connell was elected to the AIChE Board of Directors in 2014 and was named National Outstanding AIChE Student Chapter Advisor in 1981 and 2013. Dr. Leopold Selker is a former President of the NorthShore University HealthSystem (NorthShore) Research Institute, the nation's ninth largest comprehensive hospital based research program. Prior to NorthShore he was Dean of the College of Applied Health Sciences at the University of Illinois at Chicago. Dr. Selker, who has held over 50 national-level appointments, is a recognized authority on aging-related health policy, health promotion and disease prevention, and gerontology. A former Scholar in Residence at the Institute of Medicine, National Academy of Sciences (NAS), Dr. Selker has served as a member of its Committee on Health Promotion and Disability Prevention and of the NAS/NRC Planning Committee on the National Information Infrastructure in Healthcare. He has held consultative appointments with numerous foundations including the Pew Charitable Trusts, The Kellogg Foundation, the Commonwealth Fund and the Hartford Foundation. Dr. Alers has performed basic research into the properties of solids, primarily metals, at Westinghouse Research Laboratories, Ford Motor Company Scientific Laboratory, and the Science Center of Rockwell International. He was President and CEO of a small business performing advanced development of ultrasonic sensors for nondestructive testing of structural materials. He also served as group leader for new methods of quantitative nondestructive evaluation at the National Institute for Standards and Technology (NIST). His major areas of research have included: crack formation and propagation in single-crystal metals; elastic and anelastic properties of metals under extreme conditions of pressure, temperature and magnetic fields; and ultrasonic wave propagation in structural materials and anisotropic solids. Dr. Alers’ current interests include: electromagnetic excitation and detection of ultrasonic waves in metal structures without physical contact, i.e., across an air gap; and precision measurement of the velocity of sound and its attenuation, to assess the mechanical integrity of large engineering structures such as aircraft, bridges, pipelines, and railroad components. Dr. Grismore passed away on April 19, 2015. Dr. Grismore held the positions of Associate Professor of Physics at Lehigh University, Professor of Physics at Indiana State University, Terre Haute, and Lecturer and Research Professor of Physics at Cal Poly. He also served as an Assistant and Associate Physicist at Argonne National Laboratory, a Senior Specialist in Physics at the Scripps Institution of Oceanography, and as Staff Scientist and Senior Scientist at Jaycor in San Diego. His major areas of research have been in experimental physics, particularly in the fields of nuclear physics, oceanography and astrophysics. His current research interests focus on measuring radioactivity in artifacts recovered from space, using the highly sensitive, multidimensional gamma-ray spectrometer that he built at Cal Poly. The purpose of this research is to learn as much as possible about the radioactive atoms present in space in order to help theoretical astrophysicists develop theories on the formation of the solar system and galaxies. To further this research, he obtained a contract with the NASA/Johnson Space Center in Houston, which designated him as a Lunar Sample Investigator and allowed him to borrow space samples from NASA. As a result of his research his biography has been included in Who’s Who in America, Who’s Who in the World, Who’s Who in American Education, Who’s Who in Science and Engineering, and American Men and Women of Science.